As philanthropy chairman, I am responsible for setting up and coordinating all events within our chapter. I work with the ALS Association (amyotrophic lateral sclerosis, often referred to as "Lou Gehrig's disease) in Columbus to set things up as well. I am also responsible for setting up and running volunteer events. I am from a town about an hour north of campus called Marion, Ohio. I was born and raised there with my parents and my older brother Rahul (22) who graduated from OSU in 2007. My parents are both from India. My dad is self-employed and my mom volunteers at our local hospital. My mom keeps our whole family close to our Indian background. I am very interested in sports, human interaction and learning new things. I am a pre-med biology major. I went to high school at Marion Pleasant, where I was very involved in sports and was valedictorian. I plan on graduating in winter 2010, or maybe before that. I want to go any medical school after undergrad. I may take some time off to learn more about business as well. I work at the student ID center (Buck-ID center) on campus. I am also in Health Science Scholars program. I am applying for research positions as well. I have been with Phi Delta Theta since spring of 2006. I didn't want to join a fraternity at first, but two of my close friends decided to join and I felt it would be a good way to meet new people and make good connections. As philanthropy chairman, I am responsible for setting up and coordinating all events within our chapter. I work with the ALS Association (amyotrophic lateral sclerosis, often referred to as "Lou Gehrig's disease) in Columbus to set things up as well. I am also responsible for setting up and running volunteer events. I am also responsible for letting the chapter know when events are occurring for the community and other Greek chapters. I balance it with my school work and my job by doing as much as I can do on certain days which I am not busy. I tend to get a lot accomplished. Phi Delta Theta has not recently run any philanthropy events. However, we do participate in other Greek chapters' events. Also we help Material Assistance Providers (MAP) with their furniture drive in the summer as part of volunteerism. MAP is a nonprofit organization that provides free furniture and appliances to Central Ohio families living in empty houses. I really enjoy the feeling of having responsibility and helping out all these good causes. Since I have joined, we have been involved a lot more with getting a positive image to OSU. My advice to future members is to get involved in the improvement for everyone in and out of our Chapter. I feel I have a great sense of power and respect for what I do and how I get involved. Other people often tell me "I wish I could get involved," and I am the guy to go to get involved and help this world out. Jake is currently beginning his senior year as an undergrad at Phi Delta Theta. He is studying Operations Management and Finance as a major. 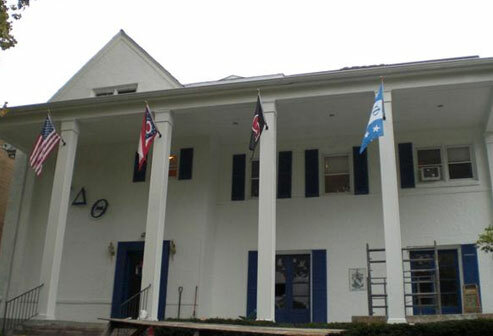 Why did you join Phi Delt? I had a couple of older friends who were members, and when I visitied the house I found it to be a group of guys I really enjoyed hanging around with. What is your best Phi Delt memory so far? Our spring camping trip every year is the best event that I never remember. How have you become involved in the house? I was the Recruitment Chair last year and am currently serving as the Vice President. How has your experience living in house been? It has truly been an experience. When I moved in Sophomore year there were only 27 guys living in and there were extended periods of little-to-no hot water and no internet service. The house was a deal breaker when it came to convincing rushes to join the fraternity or trying to convince brothers to move in once they had joined. Slowly but surely, we have made improvements to the house and as a group made a commitment to creating a better atmosphere and the fruits of that commitment are beginning to show. We have 40 people living in the house this year and have begun work on remodeling our front room. We also had our pick of sororities for social events this year. If you had told me three years ago that the state of the fraternity would be where it is today, I would have laughed in your face. It is a testament to a solid group of guys really dedicating themselves to bettering our fraternity and taking the Phikaia oath seriously. It is also a testament to the hard work and patience of Scott Armstrong ’85 and our housing corporation, who have been front and center in helping us with these changes. How would your life be different if you never joined Phi Delt? There are currently a lot of guys in the fraternity that come from diverse backgrounds with different interests.I can honestly say that there is a large group of people I would never have gotten to interact with or know if I had not joined Phi Delt. What are your plans and goals for your future? In this economy, my first goal is to simply find a job. Also, I hope to be able to be comfortable enough to contribute some of my time/money back to the fraternity that has given me one of my best life experiences. What other activities are you involved with on campus? I am a member of the Business Operations Management Society (BOMS), Fisher Cares, the Business Honors Community, Keep a Child Alive and The Barbeque Club when I’m hungry. What has been the best part of your Phi Delt experience so far? The best part of my Phi Delt experience has been living in the house.Having 40 of your closest friends around at all times is an experience that I doubt I will ever be able to enjoy again. Have you had any direct experience with your alumni? If so, what was the best part about it? I honestly haven't been able to interact with the alumni as much as I’d like, but in my limited experience I have found that is interesting to see how much things never really change in the Phi Delt house as far as the personalities and stories associated with it. I can also say that it is incredibly entertaining to hear old stories of activities that were acceptable back in the day that would lead to us getting arrested or kicked off campus today. Why is it important for alumni to remain connected with the active chapter? It is a great way for rushes and new members to see the potential benefits of joining Phi Delt and getting involved in the fraternity. I know that there are many, many successful alumni from Ohio Zeta, and it would be really great if we could set up more ways for them to share their stories with the actives. We have a great group of guys who would truly be interested in hearing advice on careers and life from successful Ohio Zetas. Throughout the history of human civilization, very few people have lived the type of lifestyle that I enjoyed during my time at Phi Delta Theta, Ohio Zeta. This is perhaps a bold statement, but one which I have been pondering over for many years now. I was very lucky during my college years to have received emotional and financial support from my parents and grandparents. I did not have to work to buy food or to pay off future student loans. My only focus was academics, and even those never posed too much of a challenge. Indeed I was experiencing a brief period in my life of absolutely zero responsibilities or consequences. It was a magical time. Sure there were a few things I needed to accomplish: go to class (but as I said, it was too easy), recruit new pledges (this was way too easy, we were having so much fun the house sold itself), and be sure to eat everyday (thanks, Chef Nina). Think about how many people in the history of the world have lived like I did. Who has experienced time in their young adult lives where they had no responsibility to anyone? Europeans in the Middle Ages? There may have been a few royal sons and daughters that just hung out, but nearly everyone else was hard at work. Young Americans in the 1940s? They went off to war. The only real worry I had was the undeniable fact that this part of my life was labeled with an expiration date: June 6, 2004 – graduation. I suppose the ultimate goal in this world is to make each stage of your existence into the best time of your life at that specific point. So when you are 18, being a senior in high school should be the greatest thing ever, and when you are 21 being a senior in college should be the greatest thing ever, and maybe when you are 45, working at an office and trying to raise two teenagers into respectable people should be the greatest thing ever. For me, it broke down like this: from ages 13 to 18, I thought going to college would be the greatest thing ever. From ages 18 to 21, I knew going to college was the greatest thing ever. From ages 21 to 23 I was worried that college was the greatest thing ever, and that it was all downhill from there. Recently, I have made steps to overcome this fear, and it all comes back to being a Phi. In 2001, I met a pretty cool guy named Steven Schranz who had just accepted his bid. I had pledged in the class before his, which meant I was his Shiny Pin. The more I learned about Steven, the more I respected him. He graduated from high school the same year I did, but he had postponed college for a year to take care of his younger brother and sister. His father was no longer around and his mother had just lost her battle with cancer. I asked him where his siblings were now, and he told me they were back in Queens, living with his grandparents, one of who suffered from Alzheimer’s. Steven spoke about his family in a casual manner. What many would have seen as an incredible burden, Steven saw as his duty. He was just happy to have the opportunity to go to school, and happy that he could put himself in a place to one-day look after his grandparents and siblings. Of course this meant that Steven was trying to graduate in a mere three years. I found the very thought of such a thing appalling. Why would anyone shorten his time at Ohio State on purpose? But it was never a choice for Steven. He did what ought to be done, but would not have been done unless he did it (Robert Morrison…anyone?). Over the next three years, I became close friends with almost everyone who lived in that very special house on Iuka Boulevard, including Steven. I was sad to see him return to Queens when we both graduated in 2004. But like all good friends try to do, we stayed in contact. I watched as he built and launched his own e-commerce website, Lighters Direct (www.lightersdirect.com ). As usual, I was quite impressed with my old buddy Schranz. In the summer of 2005 I had just finished a freelancing gig at a product design consultancy in Gahanna, Ohio. Industrial Design was my major at OSU and this was my first experience as a designer in the so-called “real world”. Shortly thereafter I sliced open my right hand on some broken glass, and underwent surgery to repair an important nerve. Unfortunately I am right handed, and this meant my sketching abilities were sidelined for a few months. During this recovery period, I began talking with Steven about a possible combination of our two careers. It all began when I sent him a link to an online article about the Bendant Lamp from a designer named Jaime Salm. With his brother, Jaime had recently co-founded Mio Culture, a company that would produce environmentally friendly and spectacularly appropriate products for the modern design market. Jaime’s goal with the Bendant Lamp was to take a thin sheet of steel and create a modern chandelier while wasting as little material as possible. The lamp would ship flat and it would be up to the user to bend the “petals” of the lamp up, down, or both depending on their own desires. The brilliance of the lamp was threefold: it was easy to ship, it was aesthetically stunning, and it allowed the end user to participate in the design process. Indeed, the Bendant Lamp represented all the promise of what product design could be. Steven recognized that promise as well, and we quickly decided that these were the type of objects we should proliferate across the country. With Steven’s business savvy and my discerning eye, we put together an extensive spreadsheet of our favorite designers and the most intriguing products on the market. Some were clever, some were beautiful, some were easy to ship, and some were all three. Those were the products we targeted. It was nearly a year later, but by March 2006, we launched Follow Function, an online store for modern furniture, lighting, toys and even a few kitchen items. You can check it out at www.followfunction.com. I feel like our story epitomizes the brotherhood and friendship a new recruit can expect by joining a fraternity like Phi Delta Theta. In addition to the lifelong friends, he can also anticipate meeting important business contacts, and maybe even future business partners. But most importantly, he can learn to enjoy what could be the best years of his life, for an 18 year old at least. As for me, getting married to the girl I love while running a (hopefully) successful business with a friend I trust might just be the greatest thing ever. Ask me again when I’m 45 with a couple of teenagers. And the next time you need to buy yourself or anyone else an amazing but reasonably priced gift, remember the name Follow Function and support a couple of Phis (because now they have many, many responsibilities and no more financial aid). Thanks!